On the evening of my first day at CADD I saw my first ever Kyle Abraham/Abraham.in.Motion show. Throughout my dance studies at Spelman I have heard his name and saw clips of his work but it is a totally different experience to witness dance live with other people in the theatre. When the lights came on I got excited seeing the all white stage space and then colorful people on stage. I didn’t understand the wigs at first but then I realized that it set the time period. The wigs were tall, dramatic, colorful, and theatrical. The music kept me engaged and focused on the movement, which was impeccable. The technique of the dancers was there without question, and I loved seeing the muscular bodies moving and suspending. With a mixed raced company I can’t help but think that everything has to do with the representation of race, which it did, sort of. I saw black women and white men dancing together on stage and a patriarchal image but then a subliminal image brought out that the black woman also carried the white man. After a while into the piece the white male dancer would place the black woman in the position of a dog and snap at her to come. I was sitting in my seat taken aback and uncomfortable at this image, that took me back to slavery and black women being concubines, an image I know to be true in history but it made me hot seeing it in the present, on stage. But it did spark emotion in me. Through out the piece wigs were being removed and humans and individuals were being seen. Music: “I Told Jesus” by Bertha Gober and “City Called Heaven” by Cleo Kennedy. The songs helped tell the story of this piece, gave it a church vibe, which started off with Jeremy “Jae” Neal standing on stage and lamps being dropped from the ceiling and being caught by their wires at different levels. Neal would dance under these lamps and they acted as a spotlight. I noticed a play with gestures of the black street aesthetic and gestures that are known to be feminine, which could possibly change the sexuality of this character. Dancers Tamisha Guy and Catherine Ellis Kirk joined Neal on stage and they all danced in sync. I saw crumping, I saw my brother, I saw my grandmother in some of these movements, which evolved into ballet and modern techniques. I recognized an identity struggle and a unique narrative being told of a specific black man. This piece is a perfect example of what a reshaping of the image of Black Masculinity is today. This final piece had projections as the backdrop, of videos and photos of Jim Crow South, Eric Garner being killed on the street, and many more images of the degradation of rights for African Americans past and present. The dancers were dressed in 60’s attire. I remember the image of half of the stage being a Blacks only sign on the projector and the other side Whites only and an Asian dancer, Connie Shiau, going OFF! between both sides. Then the image of two male dancers, one black and the other white dancing a duet that was powerful watching their power struggle, then they took their shirts off and they were bare, they were both human made of flesh. Music: Robert Glasper’s interpretation of We Insist! Max Roach’s Freedom Now Suite. Kyle Abraham is a current City Fellow and 2013 MacArthur Fellow who began his dance training at the Civiv Light Opera Academy and the Creative and Performing Arts High School in Pittsburgh, Pennsylvania. He continued his dance studies in New York, receiving a BFA from SUNY Purchase and an MFA from NYU Tisch School of the Arts. In November 2012, Abraham was named the newly appointed New York Live Arts Resident Commissioned Artist for 2012-2014. Just one month later, Alvin Ailey American Dance Theatre Premiered Abraham’s newest work, Another Night, to rave reviews. In 2010, Abraham received a prestigious Bessie Award for Outstanding Performance in Dance for his work in The Radio Show and a Princess Grace Award for Choreography in 2010. The previous year, he was selected as one of Dance Magazine’s 25 To Watch for 2009. 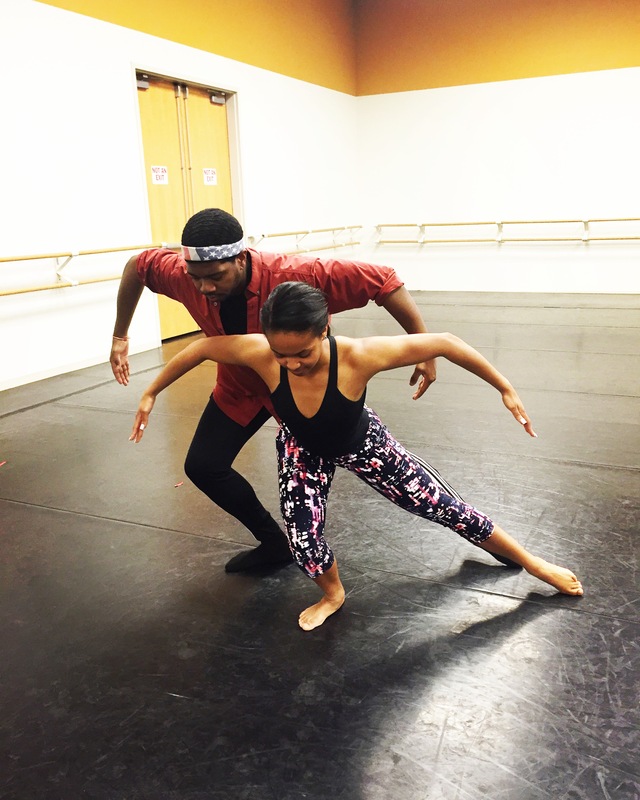 Kyle Abraham was at CADD (Collegium for African Diaspora Dance) and was dropping knowledge to young artist. References: Duke Performances Present Playbill. http://www.abrahaminmotion.org. YouTube. I saw Alvin Ailey American Dance Theatre Thursday, February 11, 2016. I made previous post in the days before of snippets of some of the dances I saw and HERE is my review. Please comment your feelings and thoughts on the dances as well! What always stands out to me about Ailey’s dancers are their shining fit black bodies. The backs the legs the everything! These performers glow on stage. What a perfect beginning to the show. I did not know what to expect but this piece took me on a cultural ride. I was in Africa, I was in Cuba, I was in Latin America, I was in West Side Story, I was in a jazz class that transformed to a modern and ballet class. I found myself shimmying in my seat and wanting to join in on the fun they were having. The connection between the company members was definitely present. I loved the costumes of the purple and red tones of 60’s style dress. CONTRACT. CONTRACT. CONTRACT THAT BACK. That is all I can say. Danced by Jacqueline Green, and she needs to be in the world wide dance dictionary for best contraction. You know it is a perfect contraction when I can feel her contraction in my spine all the way in the balcony. In this piece I appreciated the use of the scarf as a prop, for scrubbing the floors to an elegant shawl to a head scarf. The skirt was dancing as well and very much a part of the story. 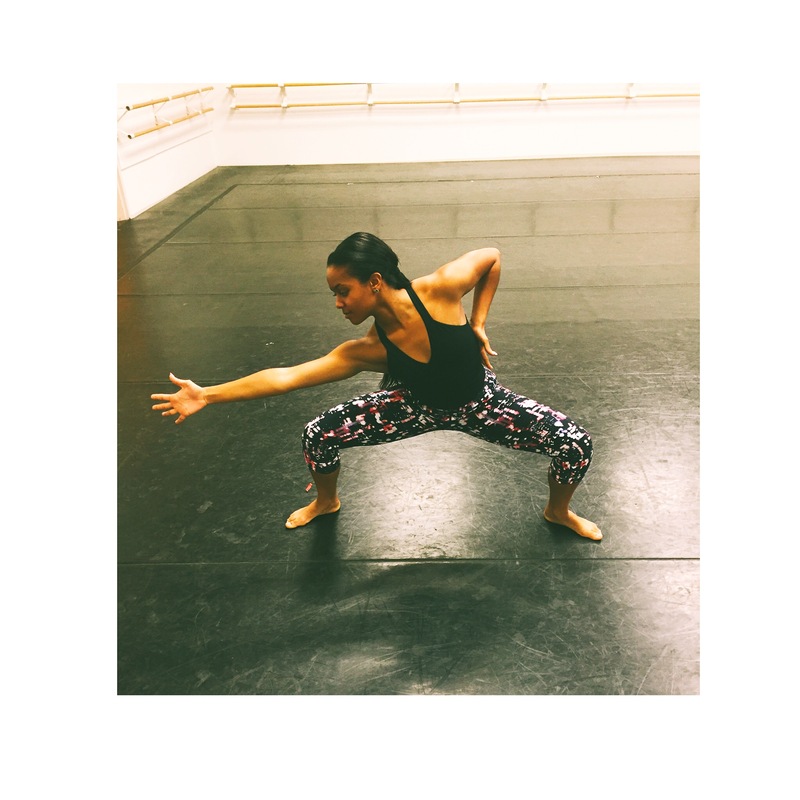 Ailey took me on a journey through the three movements of this piece and the music selections. I especially loved the song “Been on a Train” by Laura Nyro, and I was very inspired by it so I’m going to do some choreo to it! True dance theatre, what I love, the dancer makes sure the audience understands the story and journey being told. I felt these movements. And when Green’s legs developed, my jaw dropped in jealousy. All I can say is goals. DANCE GOALS. This show was really serving me with past, present and FUTURE. Just when I thought I was going to understand every piece Battle hit me with the abstract and it was so refreshing, nothing familiar as far as culture and movement aesthetic to place back to a specific region or time. I was able to insert my own story that didn’t even take place on this planet. The piece was quick and calm. I was constantly searching and investigating in this piece. I could study this piece for interpretation, we all could, and each of us would have something completely different. The dance was high energy. The music/orchestration was strange and other worldly, very dramatic as well putting me in the mind of a movie score. Yes I saw people on the stage but I also saw shapes and patterns. The LIGHTS, I love me some good lighting, it really gave this piece more spectacle, the dancers were no longer on just a stage, they were in outer space, in another galaxy. Perfect new peace to mix with classic Ailey rep. I don’t think the audience understood at first what was going on, I heard multiple groups of people laughing and talking, but after about 3 minutes it was silent. I was ready for a talk back at the end but I forgot we weren’t at Spelman. If you don’t know this piece already… Look up your history. This piece is always a classic and staple, never changing yet always moving. Overall this show was really inspiring for me and conceptualized all that I can do with my vision and dream! Thanks for reading. Please comment your reactions and interpretations below! Please comment your reaction below! Here is a behind the scenes look of the making of Open Door choreographed by Ronald K. Brown, along with some history of his time with Alvin Ailey Dance Theatre. I saw this piece live when I saw the company in Atlanta. I will be posting my reaction to the show soon but I want to know some of your thoughts as well. Please comment your reaction, thoughts, and response to these videos so we can have a dialogue about dance, because the conversation around art is important to the art.